Toyota has created several compact car models and luxury car models. The Toyota Celica has been a consistently popular model with a conversion convertible top model. The Solara is an upscale convertible top model that is more contemporary. Each of our Toyota convertible tops is manufactured to original pattern specifications and we offer the original fabric selection. 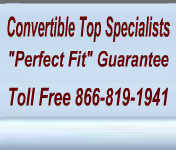 Our Toyota convertible tops will instantly renew your vehicle to show room condition.